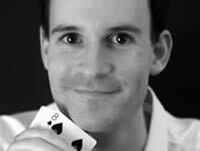 Only one finger is used for one of the coolest demonstrations of precision and skill with a deck of cards. Easy to perform with any deck, anywhere, anytime, Finger Flicker may easily become a modern classic. A lesson in routining: Complete face-up/face-down chaos magically returns to order. While not easy to perform, Master of the Mess is one of the most emotionally convincing and memorable handlings of “Triumph” to date. This unusual phenomenon of feeling colours through a table has never failed to fascinate everybody who has seen it. Colour Sense effectively replaces sleight-of-hand with memory-work and psychology to achieve a seemingly impossible effect. Providing what many consider the perfect climax to Paul Harris’ wonderful “Reflex”, High Noon is a real reputation-maker. Done in the right situation, this is the piece they will remember you for in years. From a shuffled deck, the performer stacks four perfect Poker hands in less than ten seconds. Solid dramatic structure and simplicity of plot make Cincinnati Pit one of the most powerful demonstrations of card-control for the professional performer. The most “impossible” piece in the book: Three selected cards are found at three named positions under impossible conditions: The performer never touches the deck after the numbers are named, the spectators can change their numbers up to the last moment and -as usual- Triple Countdown is performed with a borrowed, shuffled deck. A true performance piece in three phases: Demonstrating the amazing effect a certain drink has on the performer’s memory, he instantly and repeatedly recalls the order of a thoroughly shuffled deck. The playful presentation and dramatic structure truly make this routine Unforgettable. This essay describes a psychological strategy that allows you to do all sorts of secret, method-related business quite openly without the need for directing attention elsewhere. Your spectators will see what you are doing, but, done correctly, crucial actions will be edited-out by the spectator’s perception, making their memory of your performance “impossible”. This essay tries to identify some of the mechanisms that cause challenges. It allows you not only to avoid being challenged, but more importantly to induce challenges you are well prepared to meet. Spectators’ spontaneous challenges can lead to some of the strongest moments possible in the performance of Close-Up Magic. This essay shows how this can be made to work for you. Card Fictions is beautifully bound in black linen cloth with the title and the image of a card embossed in the cover. The layout and graphic art is the work of Till Hergenhan; the 94 pages of text are accompanied by 59 clear black-and-white photographs by Michelle Spillner. At the innocent age of seventeen, Pit won second prize in the Category of Cardmagic at FISM in Tokio. Since then, he has become a member of the legendary Spanish “Escuela Magica de Madrid” and lectured and performed all over Europe, the US, Japan and Australia. Together with some of his best friends, he forms the German Magic and Comedy Team known as “The Flicking Fingers”. Pit Hartling makes a happy living from magic at his home in Frankfurt/Germany. The Essay Inducing Challenges is available as a free download in PDF format. For viewing you will need the Acrobat Reader wich you can download here. Card Fiction link to the shop! Card Fiction Link zum Shop!